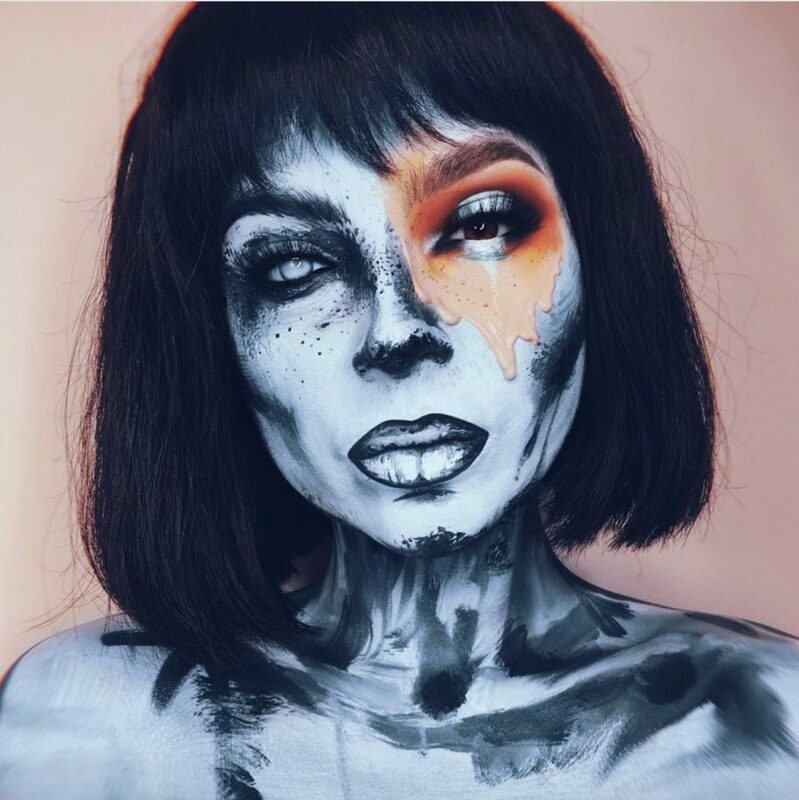 For the past few years, I’ve always searched Halloween makeup tutorials on YouTube and just picked something that I liked and followed it. 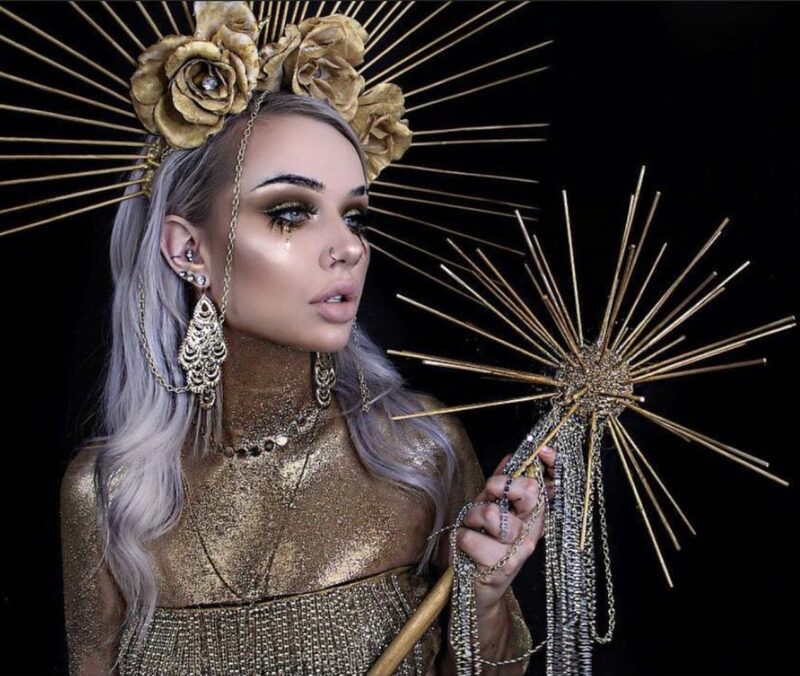 However, this year I noticed that there are quite a few seriously impressive Instagram makeup artists that do quick tutorials on their channels too. I picked a few of my favourites to show to you guys as well, so hopefully you’ll find the perfect Halloween costume to copy here, if you’re still looking for one! 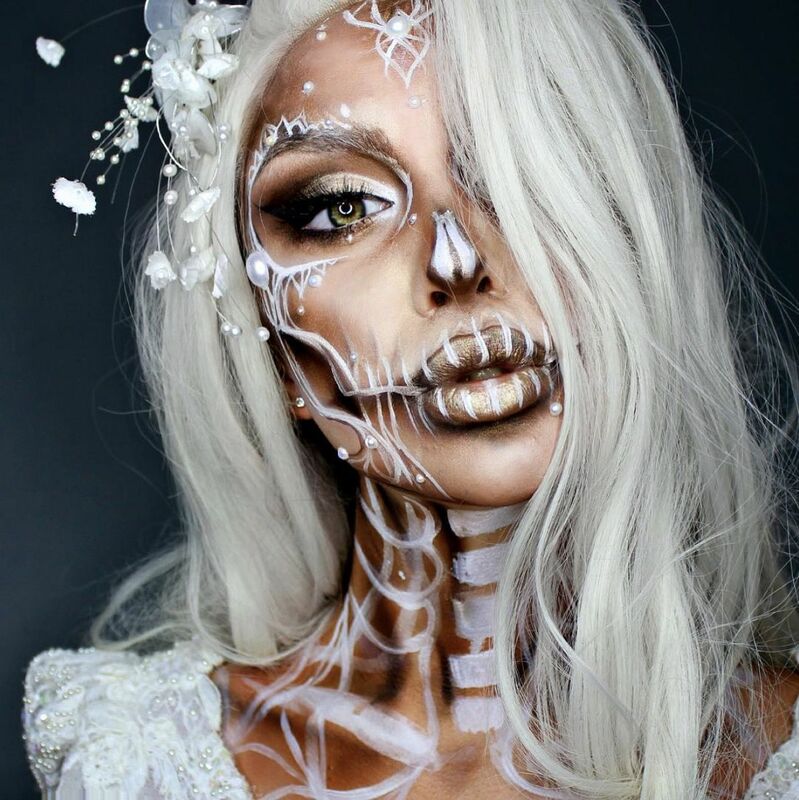 The dead bride makeup look is one of my personal favourites. It looks quite simple to do, as long as you follow the image closely. To achieve the look, you would only need to purchase white paint on top of your regular makeup, some pearls and an accessory that you’d like to wear, so it’d quite an affordable look to go with. To complete the look, you could of course purchase a wig, but that’s completely optional. 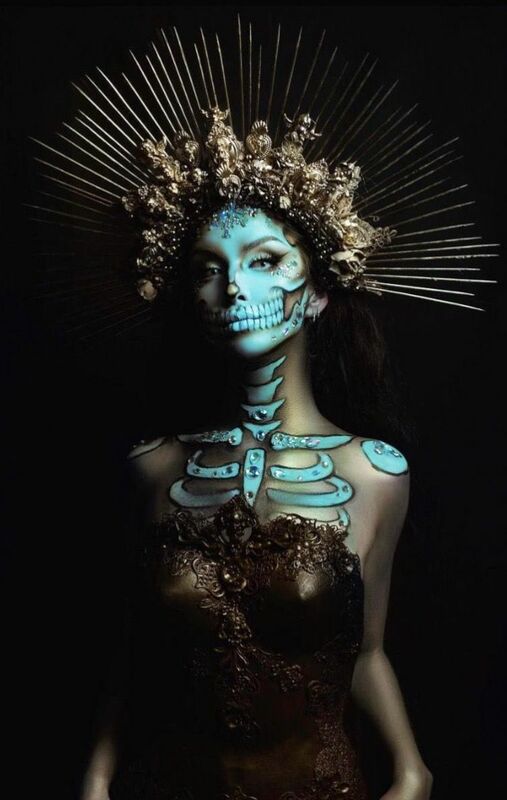 The glowing skull makeup is seriously impressive, and luckily it doesn’t require too many materials to complete. In order to get the glow, lather your skin in liquid highlighter on top of your foundation, before you start working with the eyeshadows to achieve the colorful look. 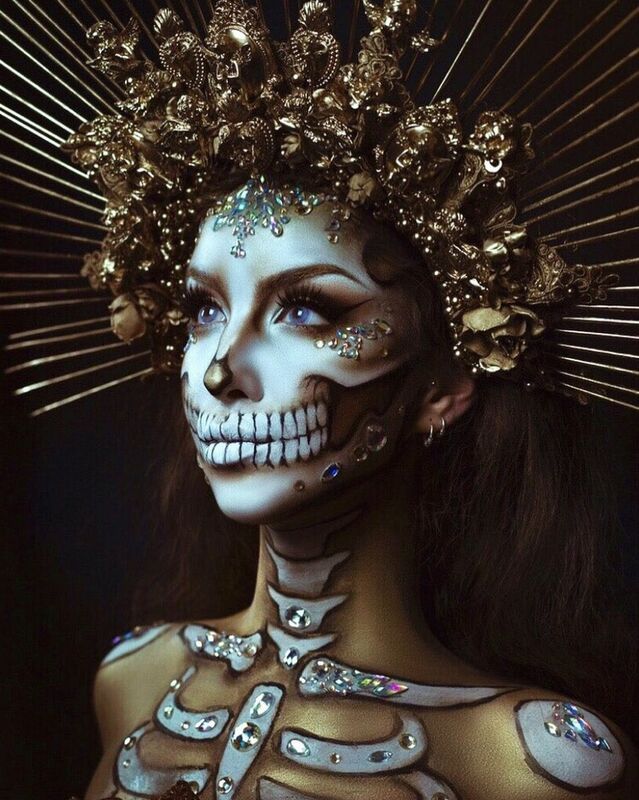 Finish the look off with rhinestones, glitter, colored lenses and more highlighter in the areas that you want glowing to the gods. 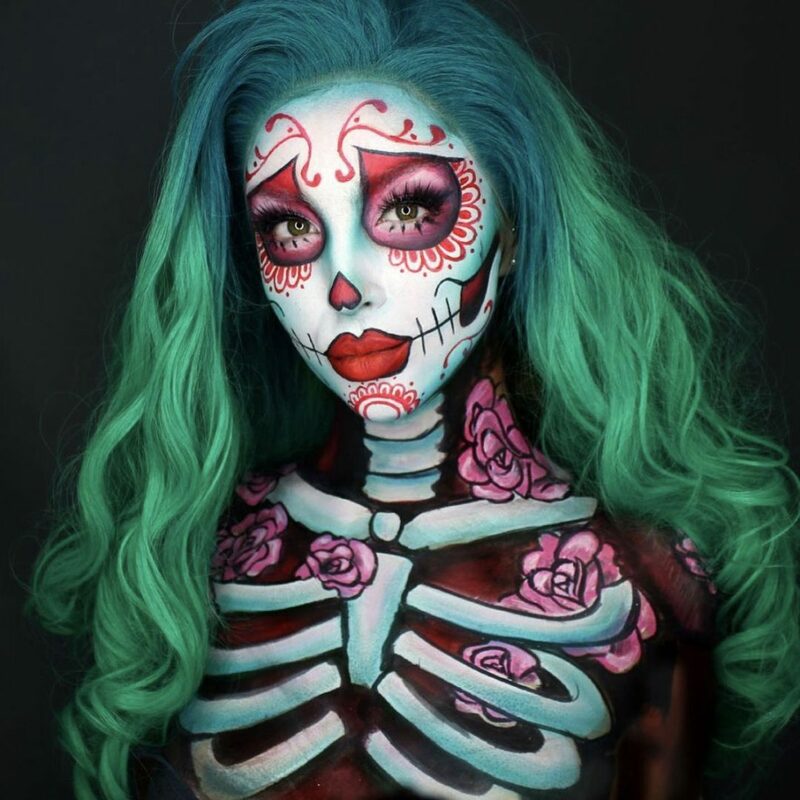 You have two options when painting your body: you can either wear a black tank top and paint your whole upper body with black paint and finish with colorful eyeshadow, or you can wear a black long sleeve turtleneck, cut holes into it and paint the skeletal features through the holes. Although the makeup on is quite straight forward, what really pulls the look together is the headpiece. Brookelle has also added some tattoo like doodles on the hidden side of her face to complete the look. Red eye makeup works best to amplify the look of the bloody heart. Although the costume is optional, wearing the right dress and a crown will instantly elevate this Halloween look. 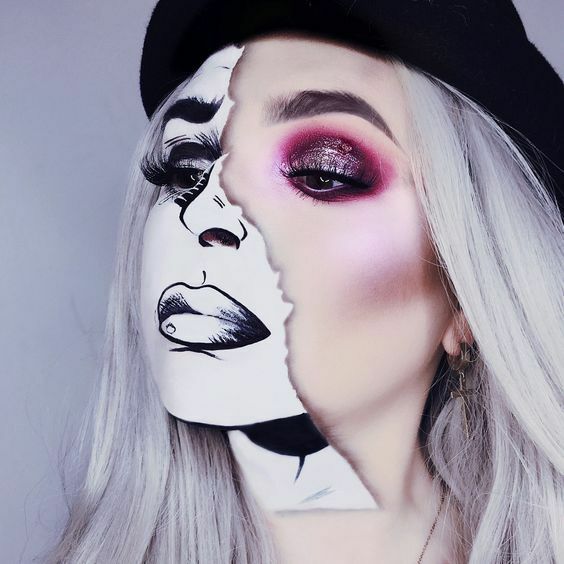 Gia Marie’s take on the traditional mime makeup is so good that it almost looks like art! To achieve this look, you will need both black and white paint, and preferably small brushes in various different sizes. 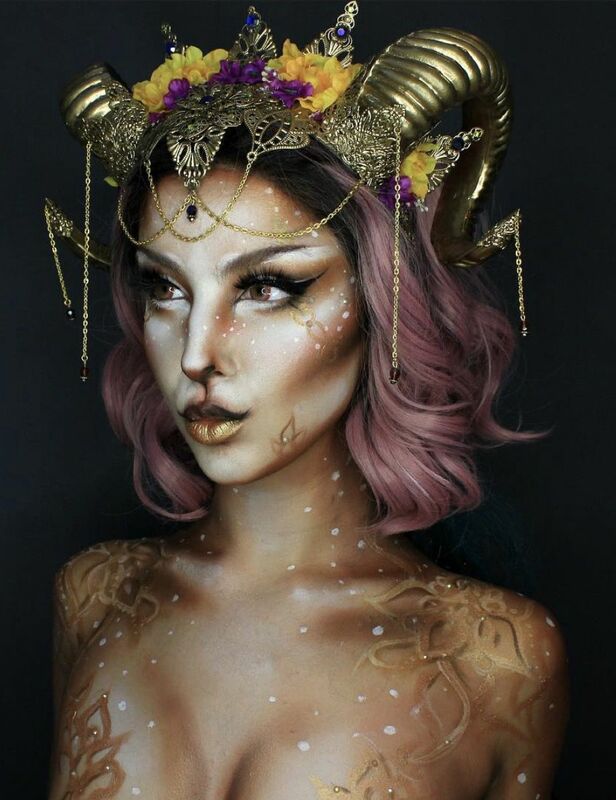 I am loving all of Ellie’s Halloween makeup ideas, and the Capricorn is no exception! The artistic masterpiece truly comes to life by adding a simple contour on the nose, stretching out the eyebrow’s a little, and by exaggerating the eyes with dark contour. Why not copy Ariana from this year’s Wicked the Musical? Everything about this look is DIY from the stenciled “Wicked” watermark to the glitter and rhinestone necklace. 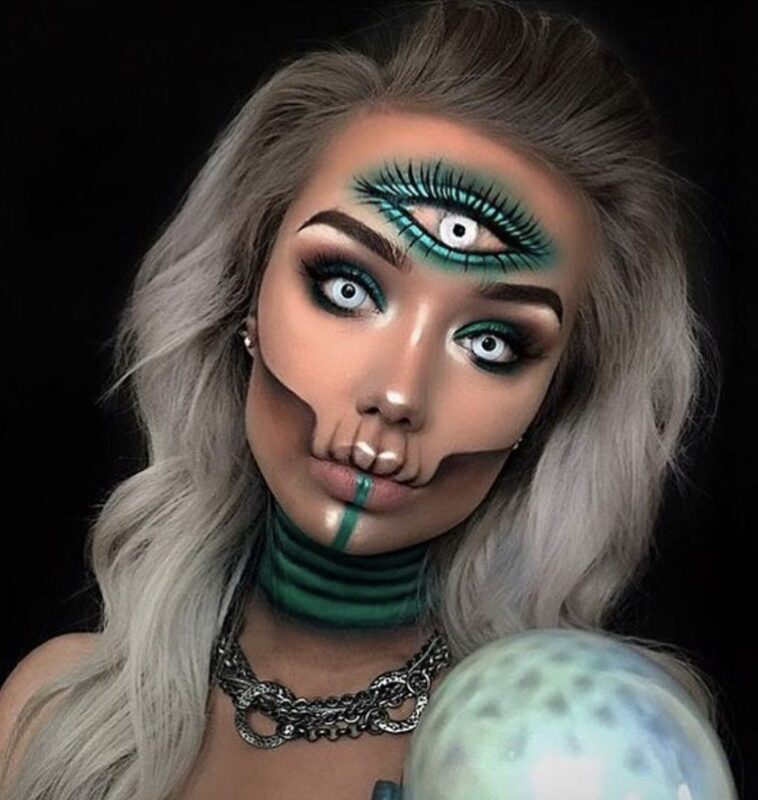 If you don’t mind spending hours putting on your makeup and taking it off, this Halloween look could be for you. 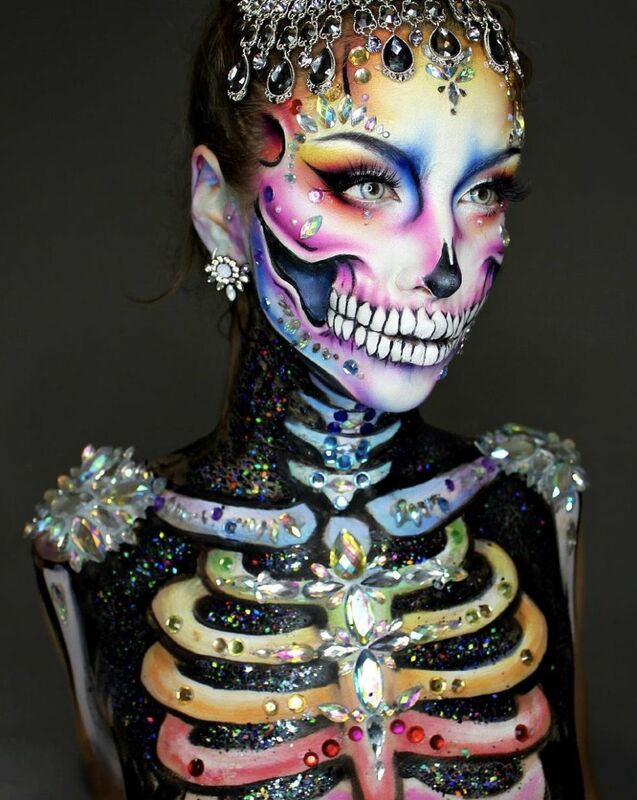 The main concept of the makeup is how the skull and the glitter come together, so you could either follow Ellie’s steps to the tee or simply create a skull to the best of your ability and embellish it with glitter and rhinestones. It’s worth mentioning that the earrings add a lot of detail into the look, so consider adding some heavy, dangly earrings like these to your costume. This costume has truly blown me away. If you want to wear a costume that is impressive, glamorous and still a little bit spooky, this is the costume that you need to wear. Pst, it seems to me that Ellie is not wearing any clothes on this picture and that her body has been completely painted, but of course that isn’t necessary if you wish to replicate this costume! 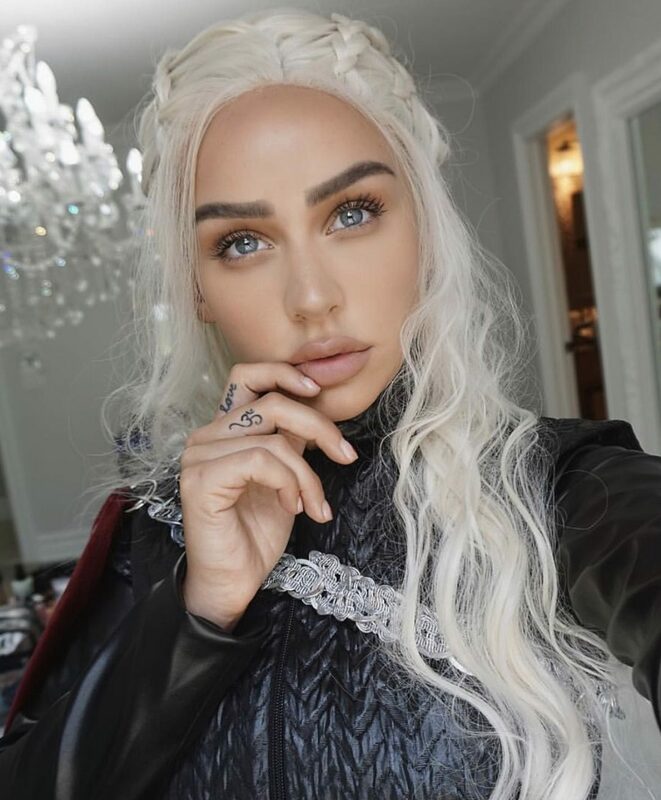 The Khaleesi costume is instantly recognisable and effective – to achieve it, you just need a Khalesi wig from Amazon, appropriate clothes and neutral makeup. If you’re eyes aren’t naturally blue, you could consider ordering a pair of contact lenses, but this isn’t necessary – you will probably still be recognised. This look is somewhat of a cross between a devil and a pumpkin – you can choose which one you like the best. You will get the best results by using a highly pigmented orange eyeshadow instead of paint – this will give the makeup a more dewy, glowy look. Finish off with hazel contact lenses, if you want. Honestly this also gives me The Crow vibes. This is the perfect costume for the true American patriots out there. 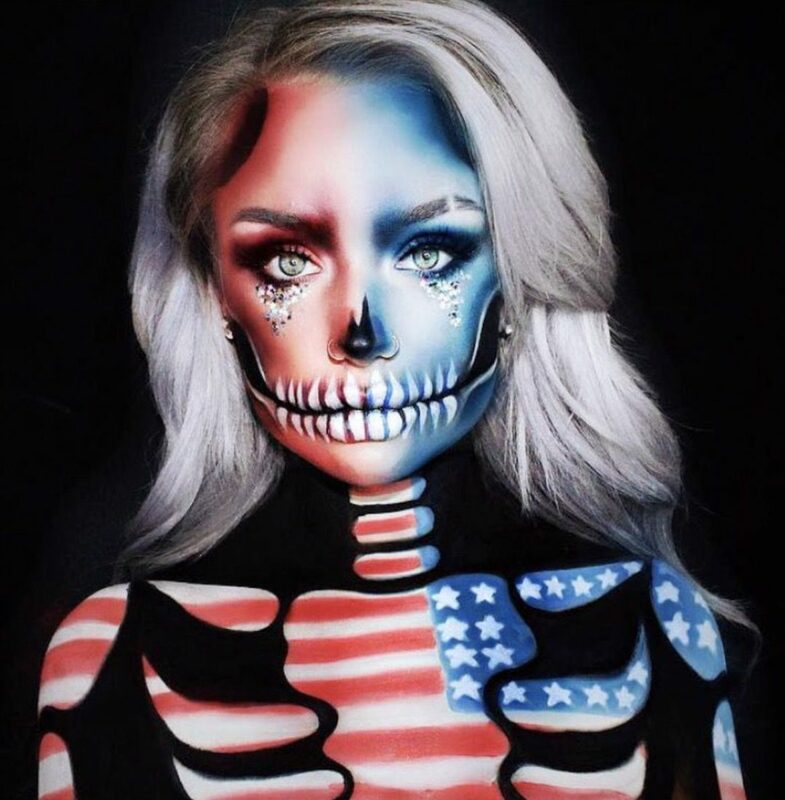 If you wish to go for a simplified version of the makeup, you could opt to wearing an American flag dress instead of painting your body. Glitter, glitter and more glitter! 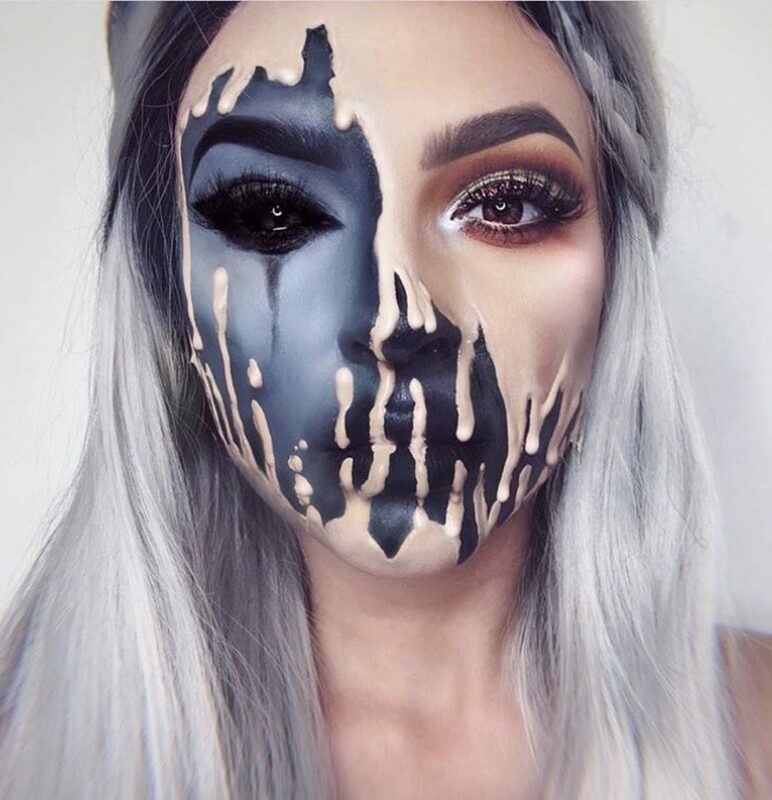 This makeup is a fresh alternative to X-men’s Mystique and it allows you to leave half of your face unpainted, so that people can still recognise you. In order to create the “wave” effect, use a bit of liquid latex to make the process more seamless. This beautiful creation is a signature look from the OfficialGlitterPig. 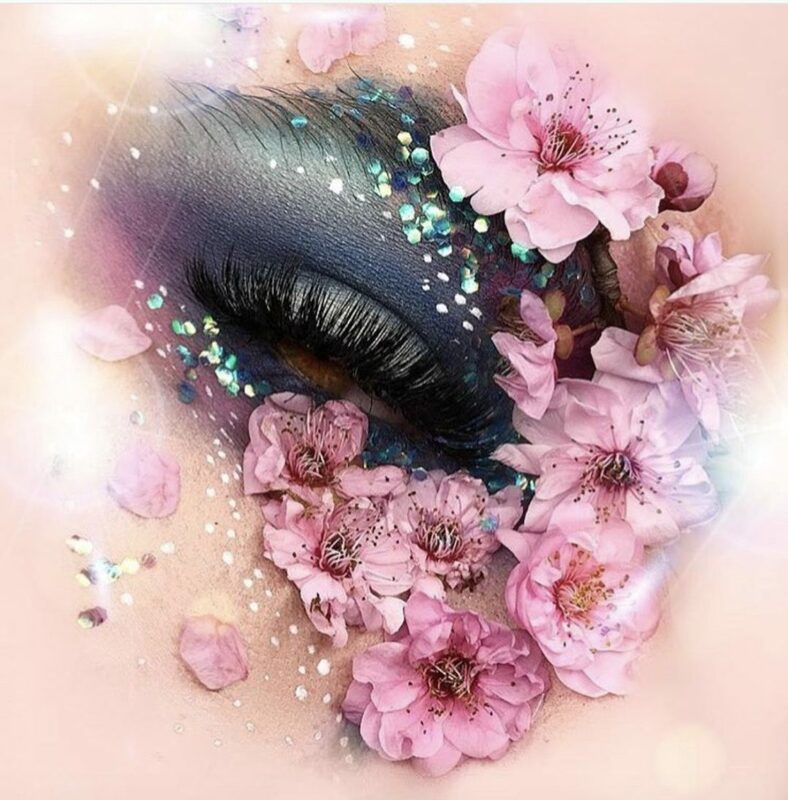 To achieve the look, glue some flowers (real or fake) onto your eye with eyelash glue. To make an even bigger impact, put similar flowers into your hair and wear a simple outfit that can bring out your eyes. Although the rhinestone arrangement on Amy’s face is impressive, the main focus of this look is on her hair. To achieve the look, you can use spray on paint from L’Oreal Colorista that will last for one day only. 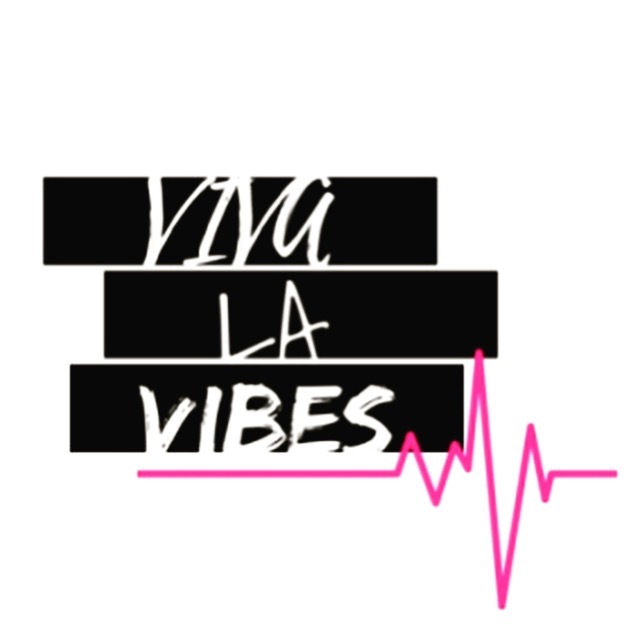 If your wallet allows, you will need five colors: pink, violet, blue, green and yellow. However, an ombre look with two colors could look equally impressive. 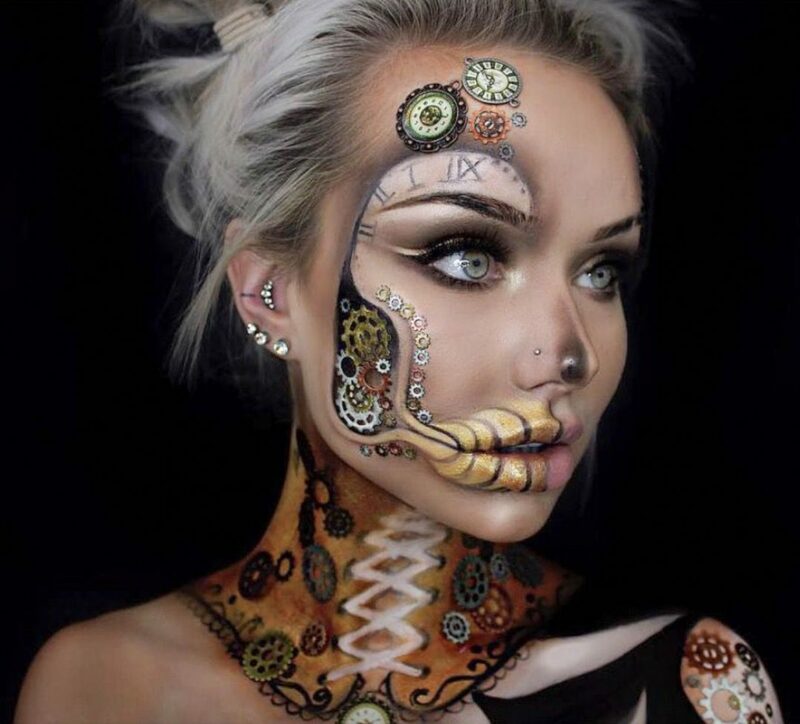 Who says that your face needs to be your main canvas? 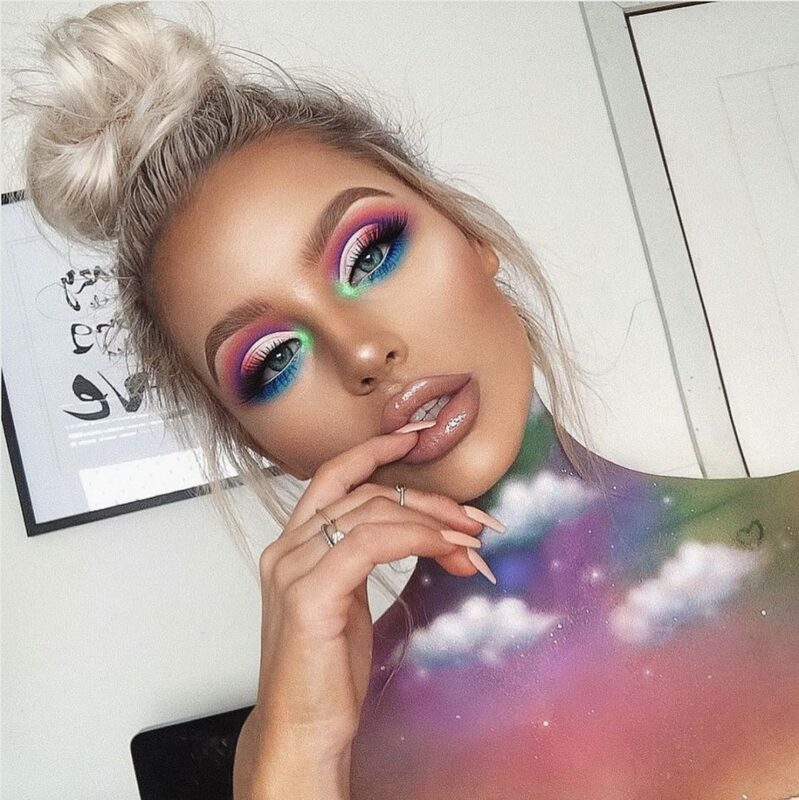 Brookelle has created a beautiful fantasy sky on her neck and decolletage. 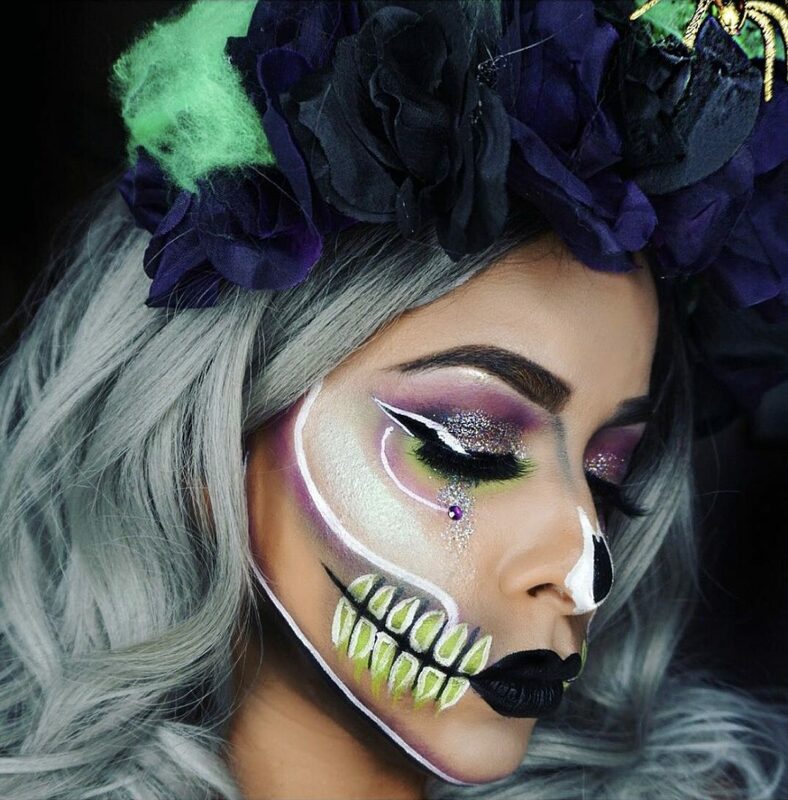 This bold, colorful look is perfect for not only Halloween, but also any festival that you may have in your agenda. 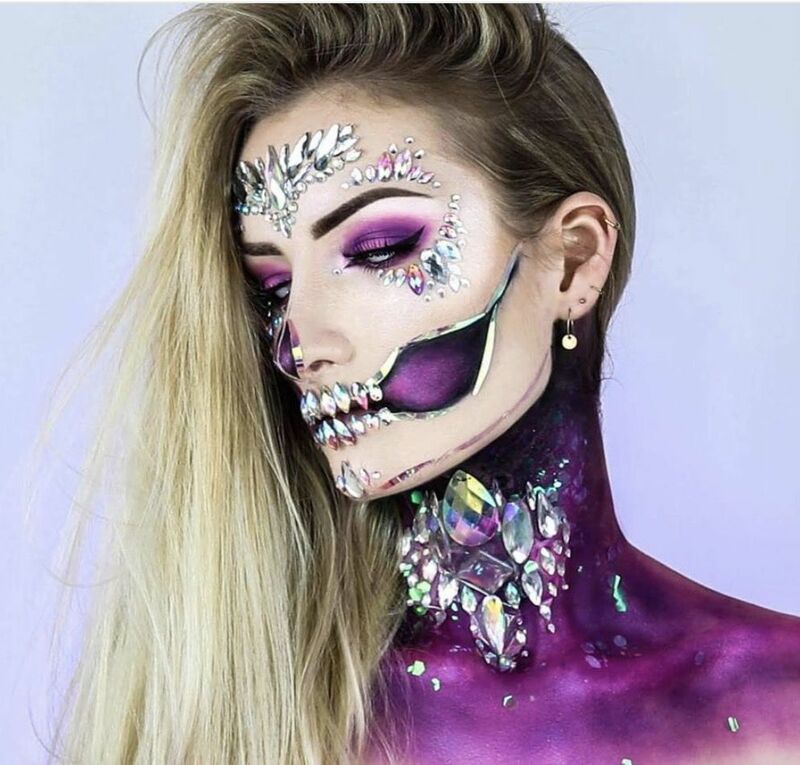 This look is a little trickier to achieve than the traditional glitter skull, because you would need to glue on little strips of hologram tape to make the slits of the mouth. 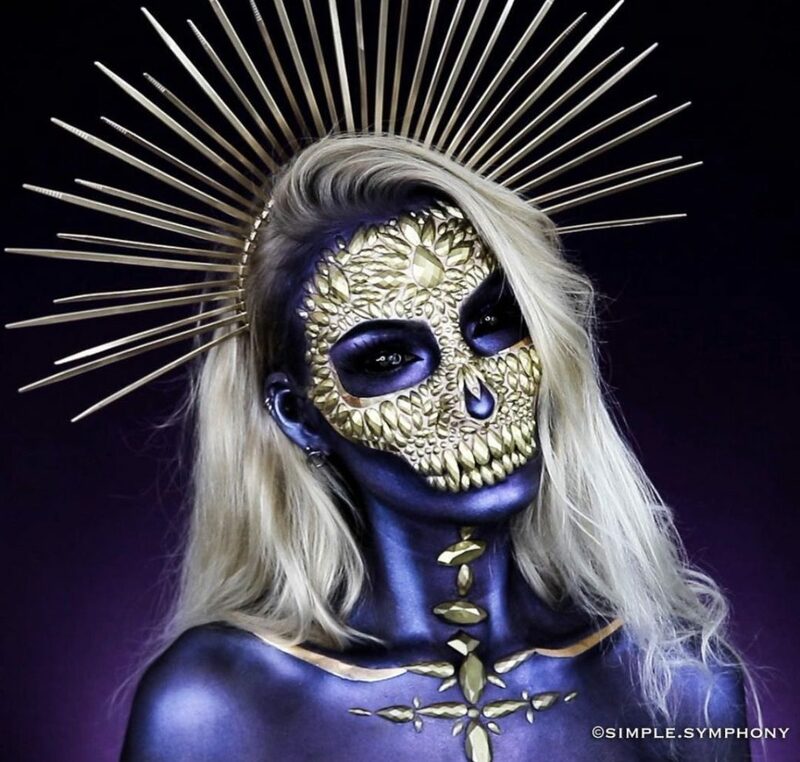 If you’re up to this creative challenge, head over to Simple Symphony’s page for more information about the look. 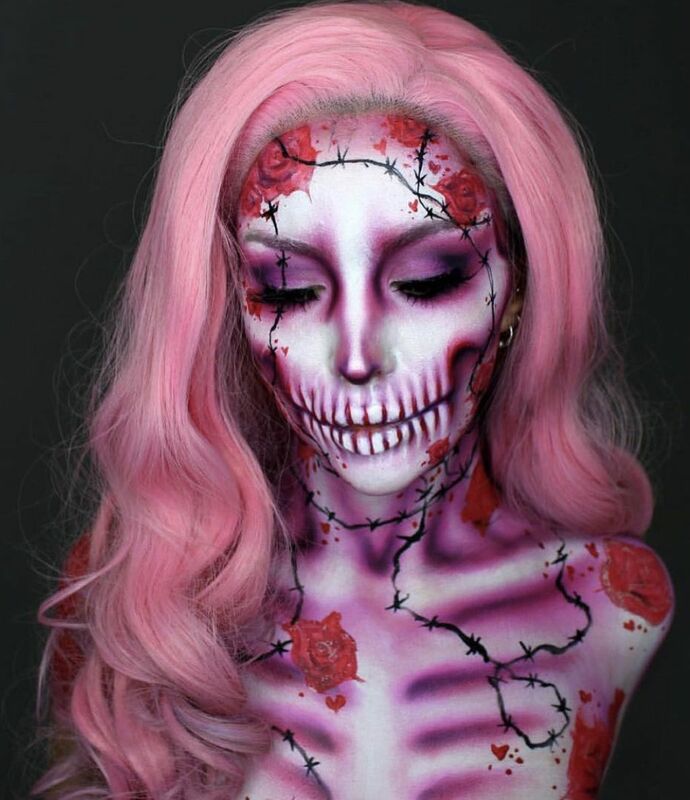 If you’re comfortable playing with liquid latex, this look could be easy to do. For more explanation on how to achieve the melting skin look, watch Desi Perkin’s tutorial on Youtube Here. 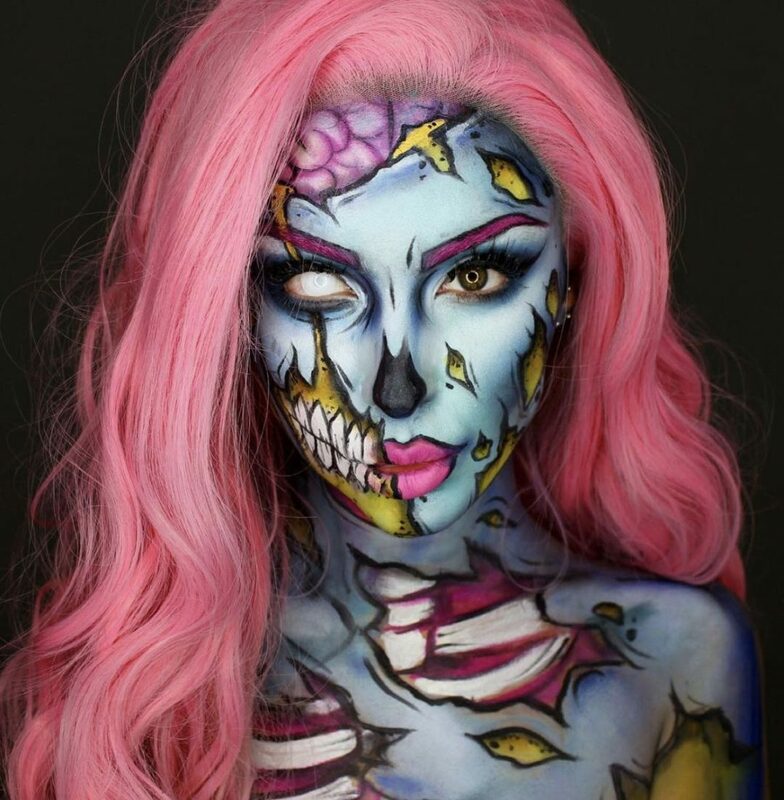 This beautiful makeup brings together a soft zombie and animal inspired look that is completed by the melting eye. 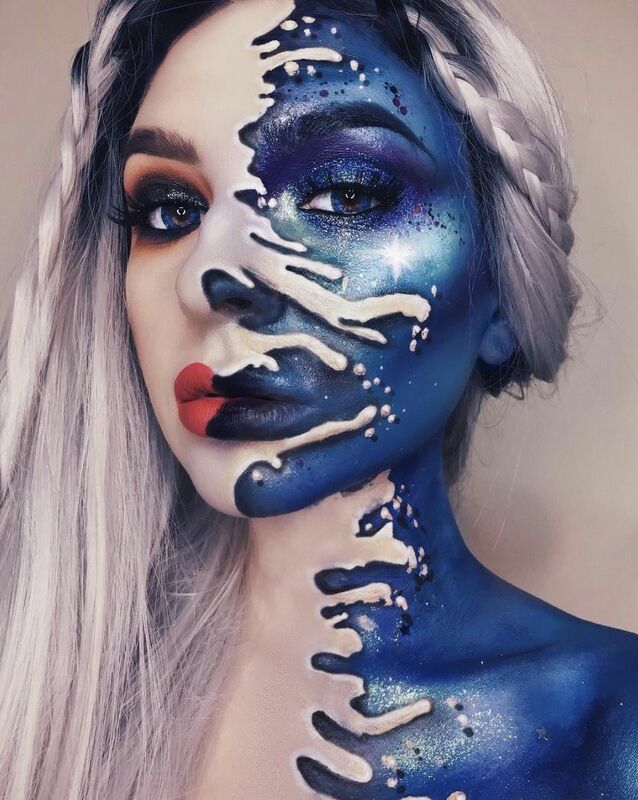 The easiest way to achieve this makeup is by using paint to draw on your face and then finishing off with liquid latex to achieve the melting skin effect. If you are looking to go for a seriously impressive costume this year, consider recreating the Dark Saviour. I can’t even fathom if this look was created with eyeshadows or spray on paint, so to get the full details, head over to Simple Symphony’s Instagram. 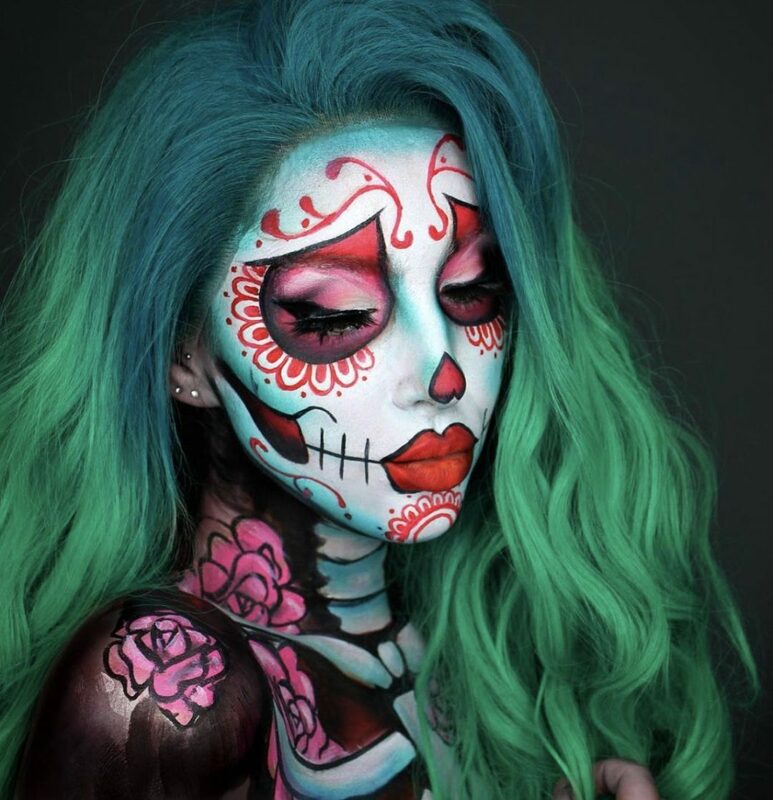 This makeup look is a unique take on the typical Catrina look that we are used to seeing around the day of the dead. 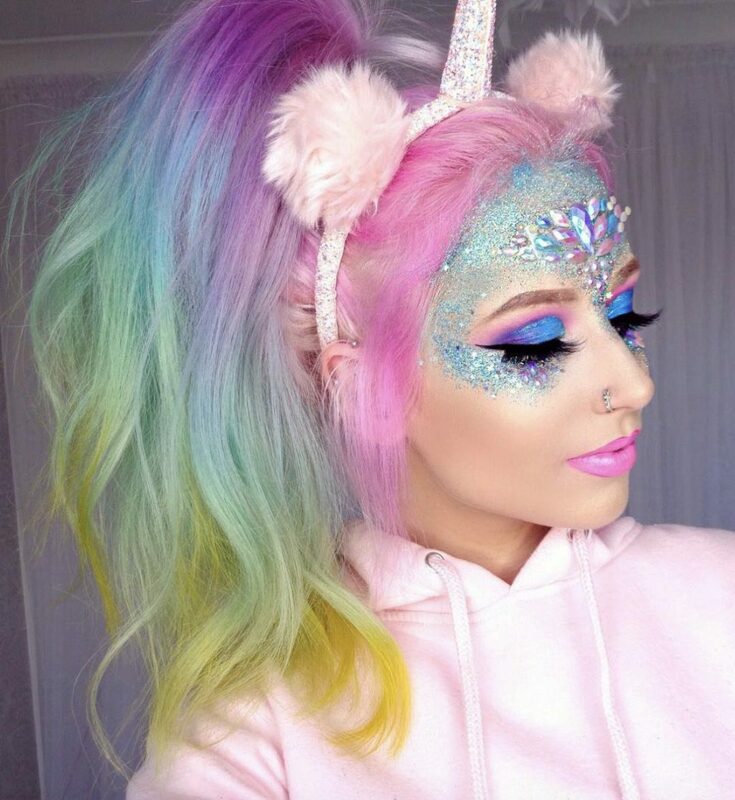 The unicorn horn and the lilac wig complete the look and add a little bit more fun into the otherwise scary costume. 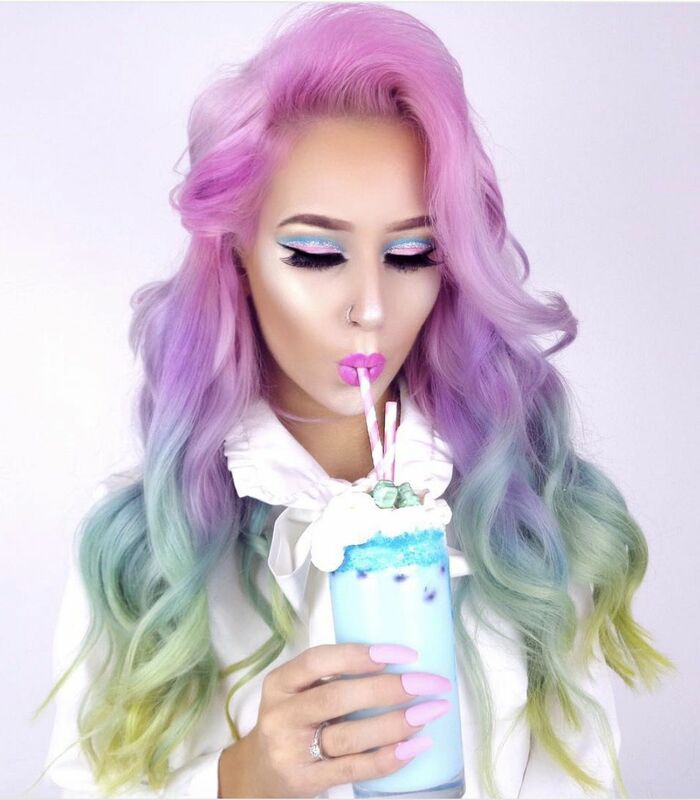 You can buy similar lilac wigs and unicorn horns from Amazon, Here and here. 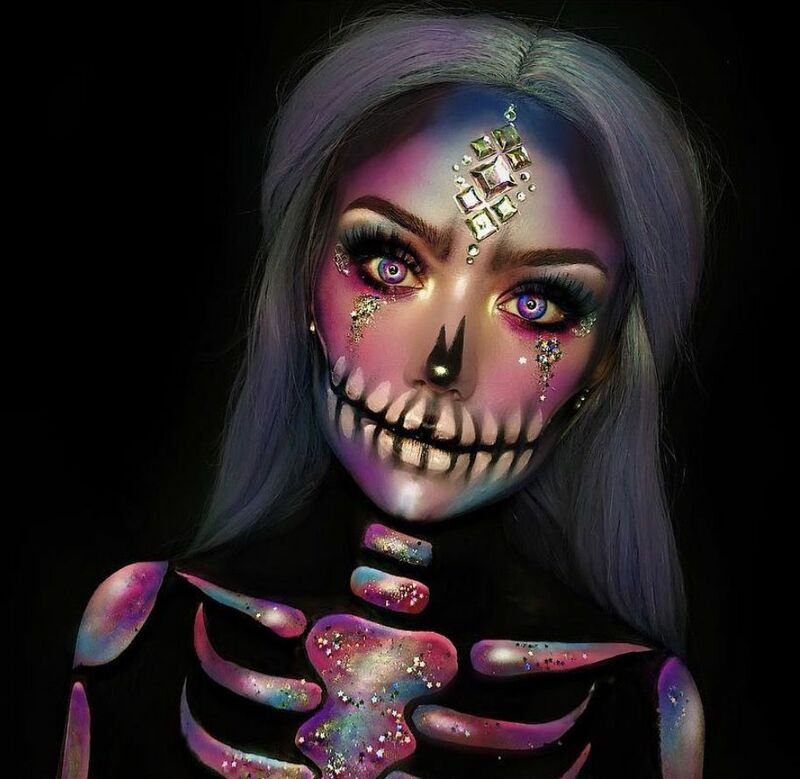 Ellie has really outdone herself with this colorful skeleton makeup look! 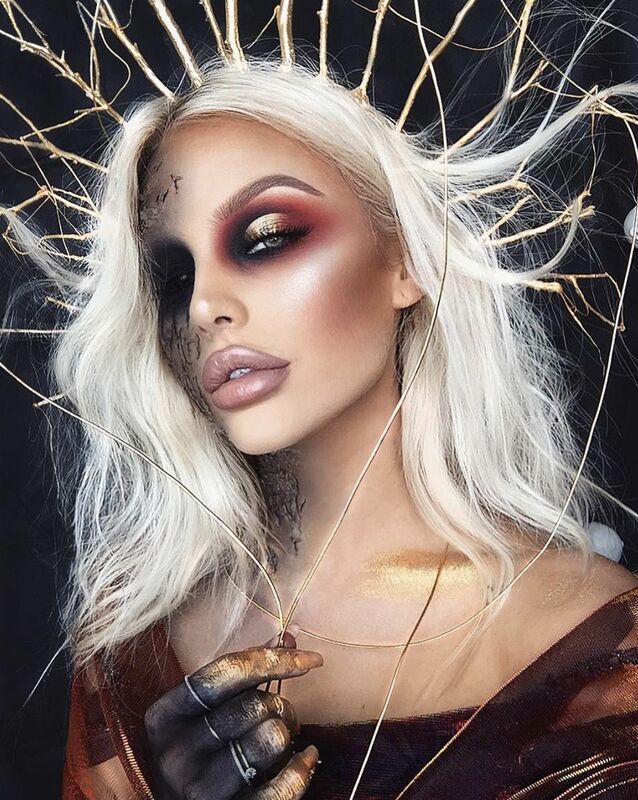 It will be very hard to emulate this look, but if you’re up for a challenge, check out the makeup details on her Instagram here. 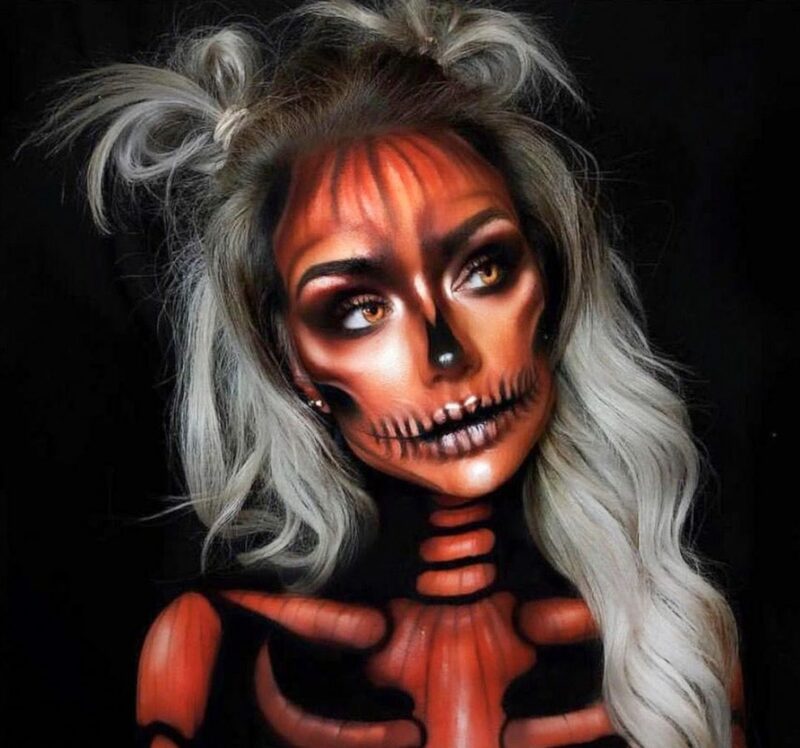 For full details of this amazing makeup, visit Ellie’s Instagram here. 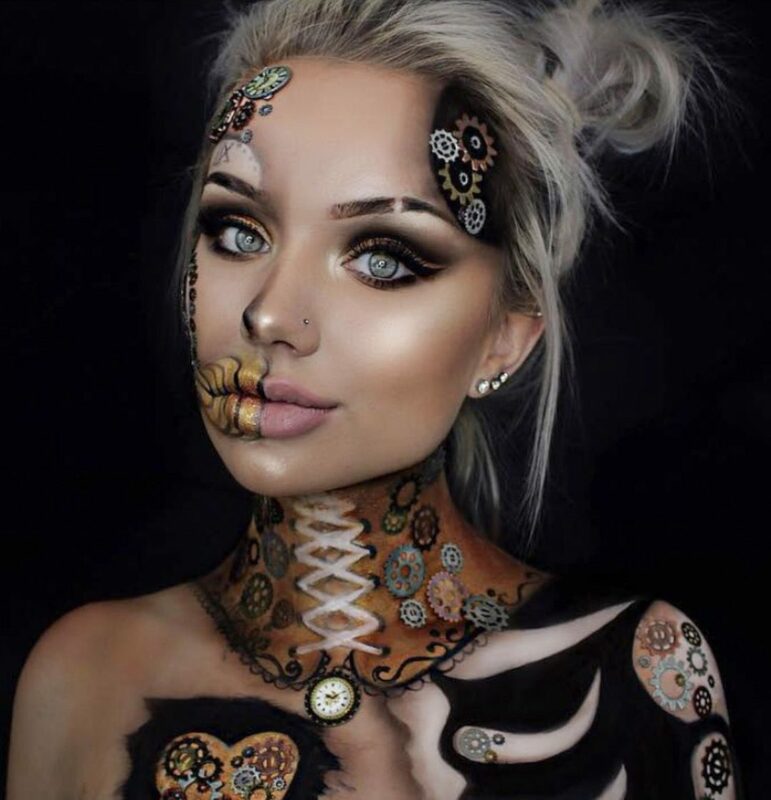 For full details of this incredible makeup, visit Ellie’s Instagram here. 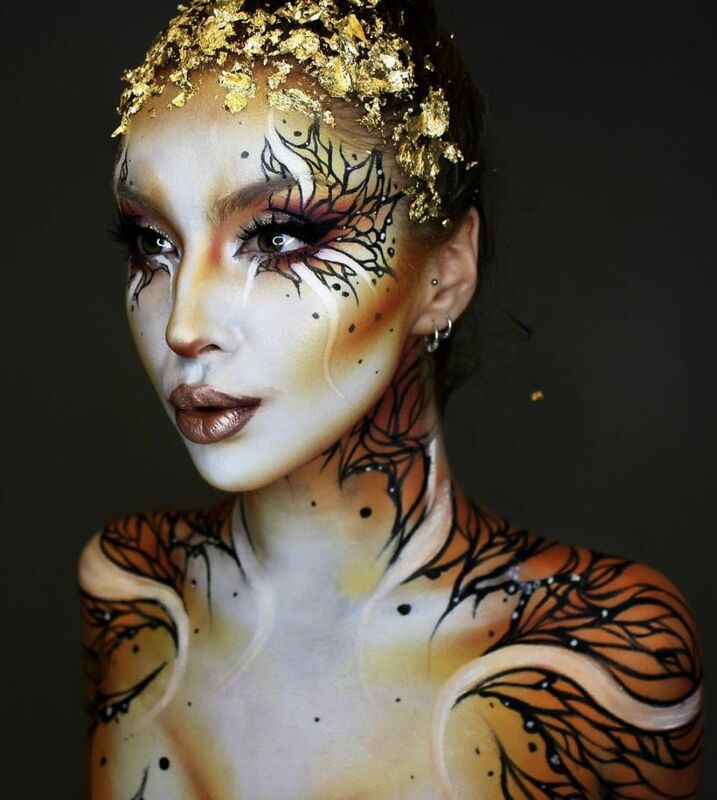 For full details of this incredible makeup, visit Morgan’s Instagram here. 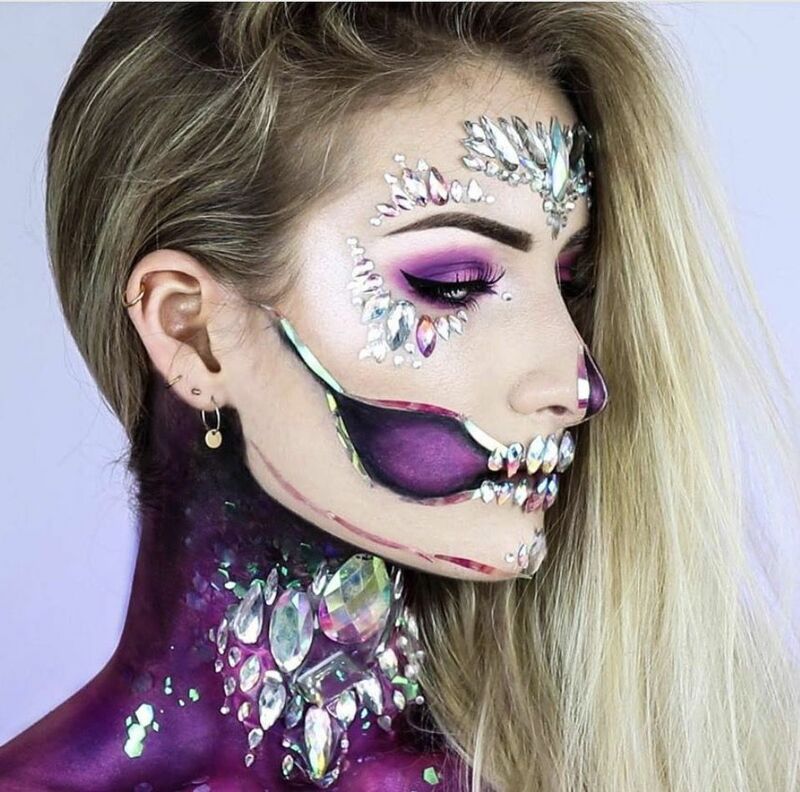 For full details of this stunning makeup, visit Ellie’s Instagram here. 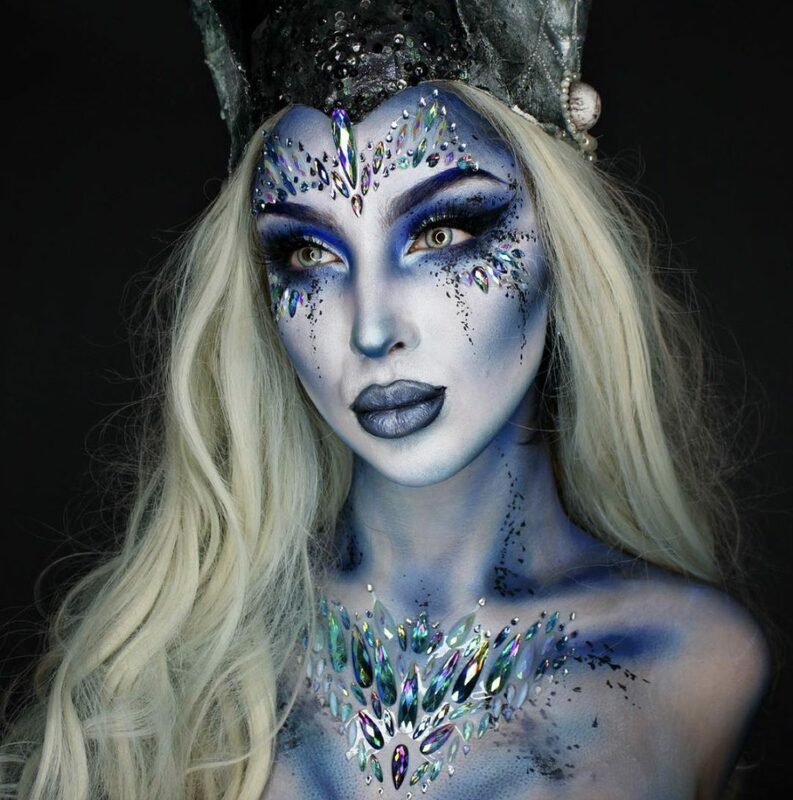 For full details of this incredible makeup, visit Jessica’s Instagram here. 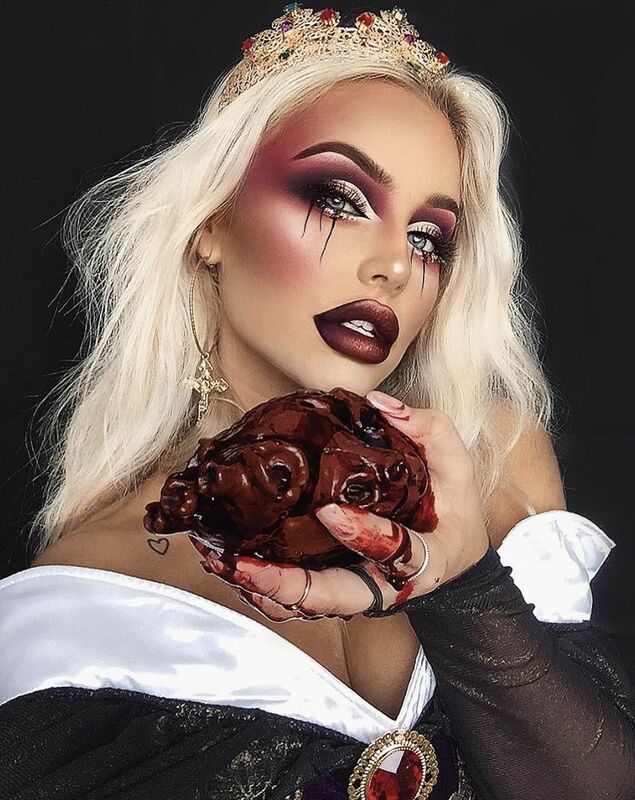 Although this picture might be an ad for Sugarbearhair and not a Halloween look at all, I thought it would make a fun costume as well. 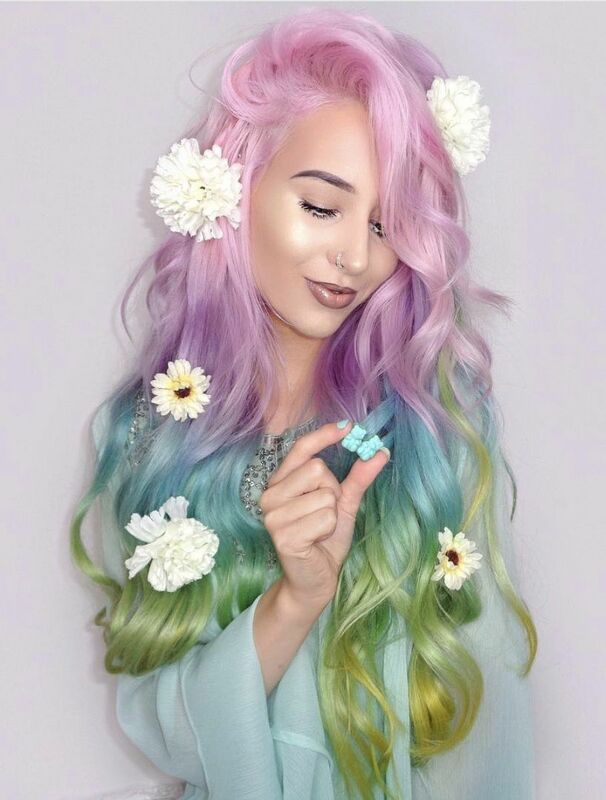 To achieve the look, either use L’Oreal Colorista spray on paint to paint your own hair or use a unicorn wig from Amazon. Then use floral hair clips to complete the full hippie look. 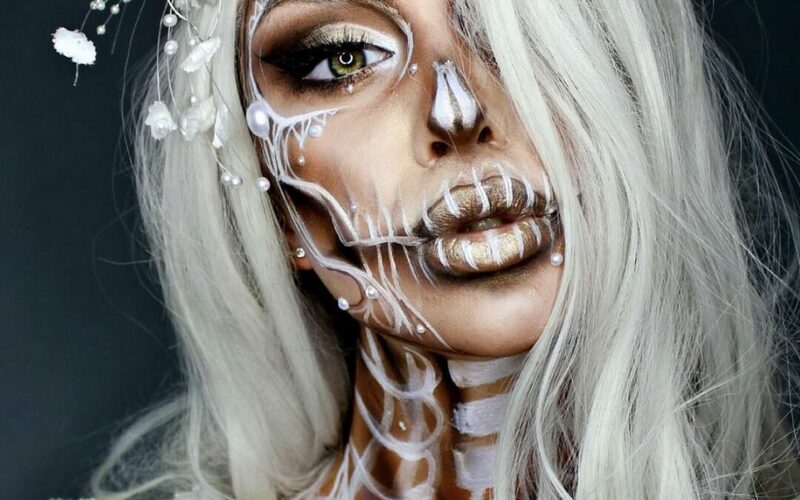 If you don’t want to buy any special effects items, a simple glamorous skull could be the best Halloween makeup option for you. 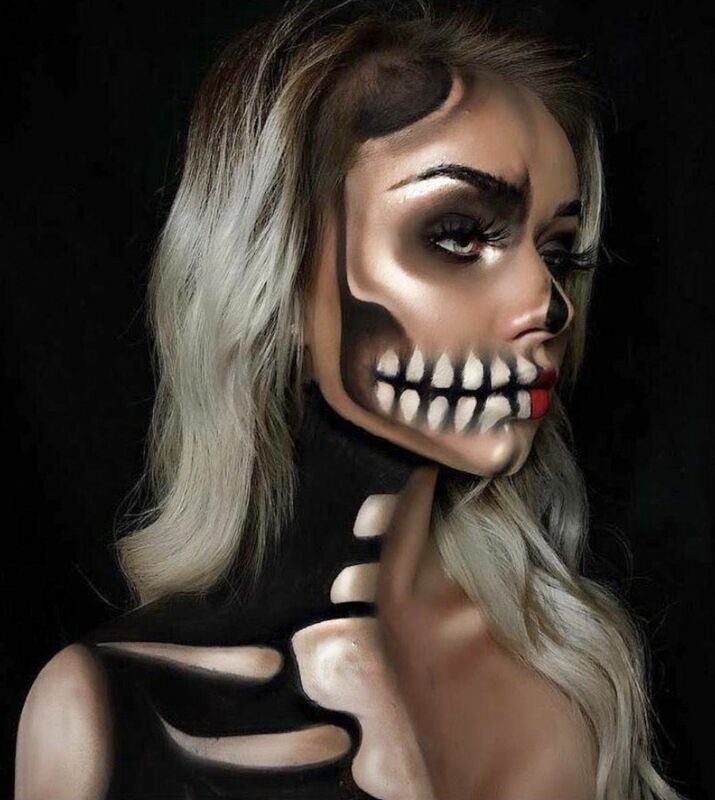 Morgan has left half of her face bare, while painting the skull half of her face in a rather sultry way. The key to this look is using a lot of highlight on the face and focusing on dramatic contouring with shadows. This Christmas inspired look is rather simple to recreate, but it will make a lasting impact among your party guests. 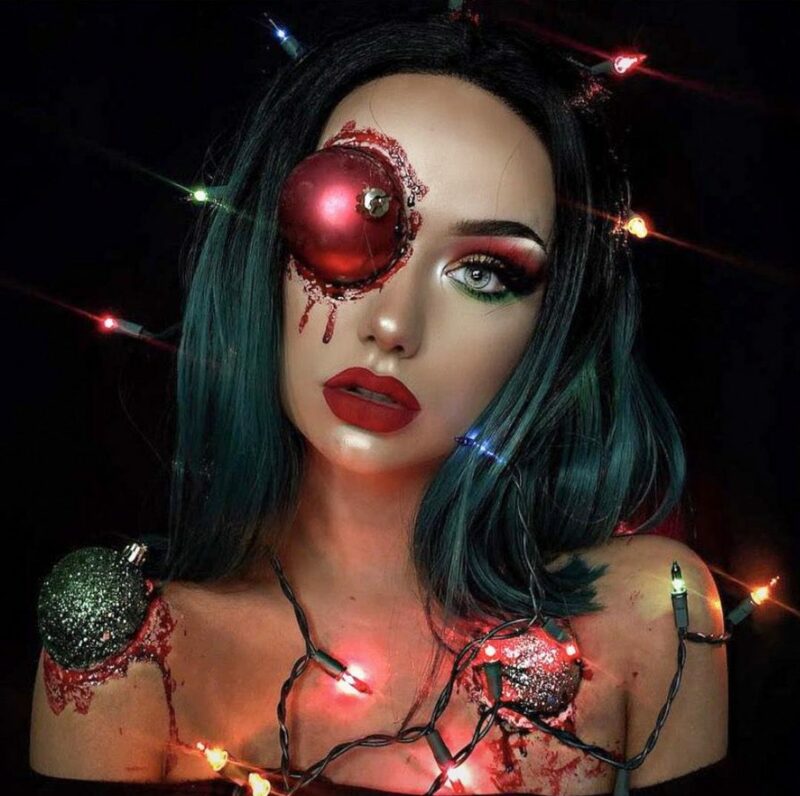 The main focus off the look is on the Christmas bulbs and lights: to attach them to your costume, all you need to do is cut the bulb in half, glue them on your skin with special effects glue, and finish off with some liquid latex and fake blood to achieve a more realistic look. You can buy battery charged fairy lights from Amazon that will last for the whole night. 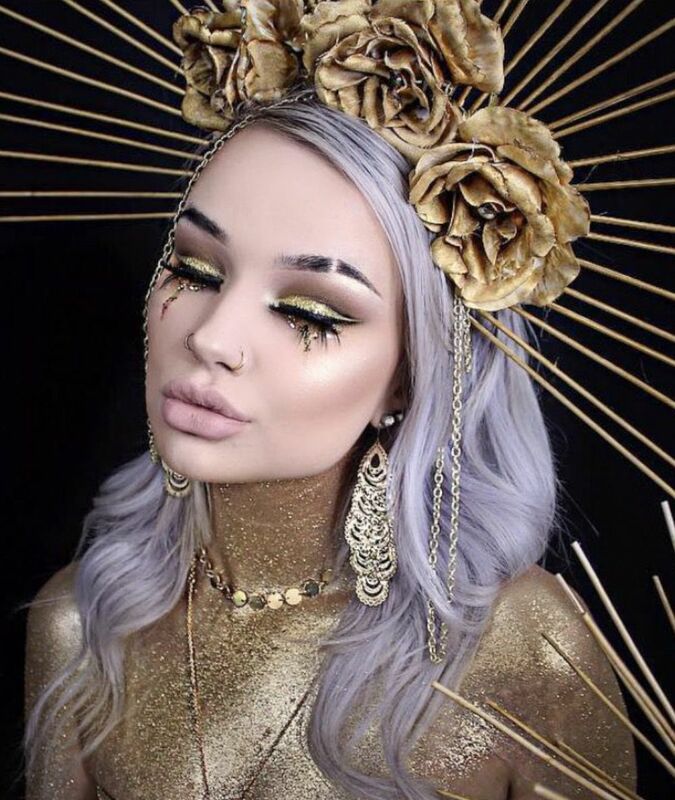 This glowy look leaves the face rather bare: the focus of the outfit is on the headpiece and the gold body. To accentuate the gold theme, add as many gold detail as you can, from golden eyeshadow to golden earrings. If you want to go to a Halloween party looking fresh faced, this look could be for you. In order to achieve it, use liquid latex to create the tears, and cover them with gold eyeshadow when done. Once again, your outfit doesn’t need to be makeup focused – the limelight can be on your hair. 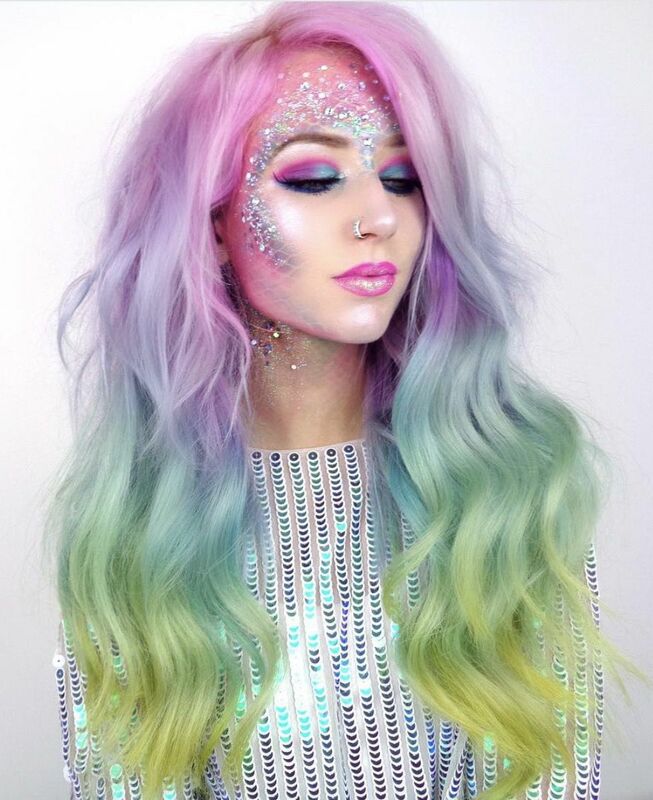 Use L’Oreal Colorista spray on paint to achieve this hair look, and a pair of fishnet tights to paint eyeshadow on your skin so that it looks like scales. 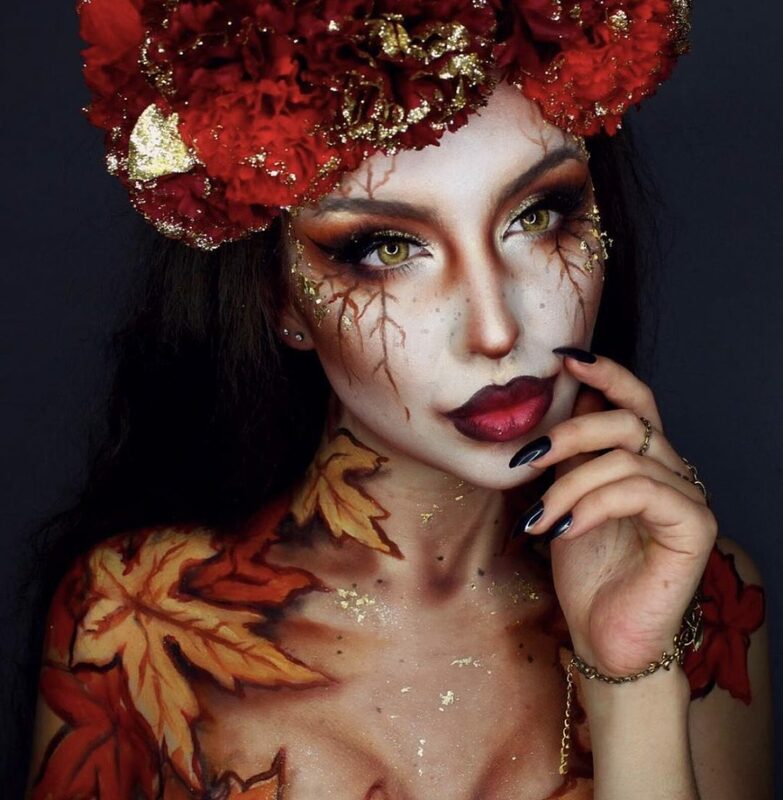 What’s The Best Place To Buy Halloween Makeup? 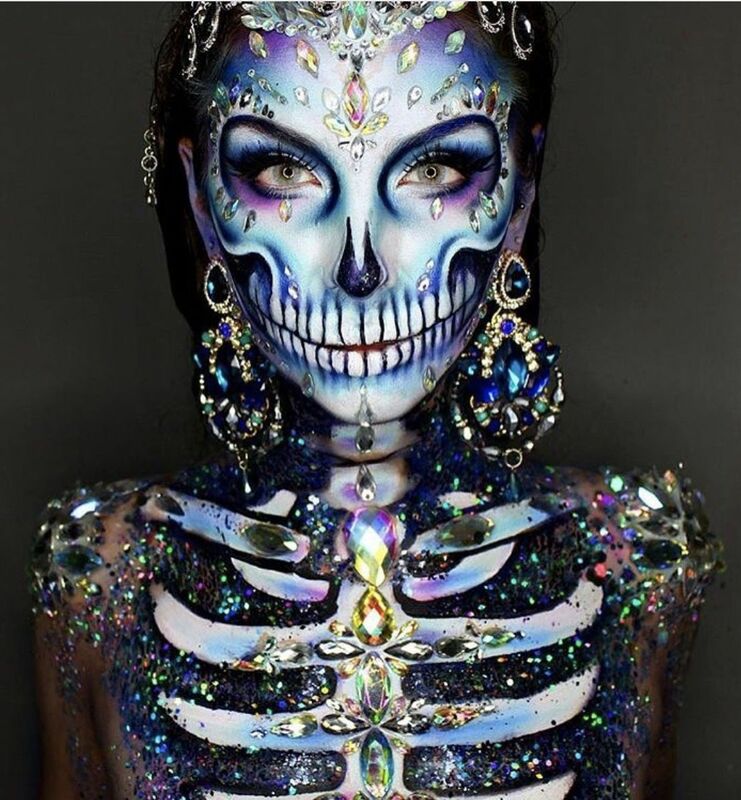 Although there are always specialist shops in every town, I still believe that the best place to buy Halloween jewellery and makeup is online. 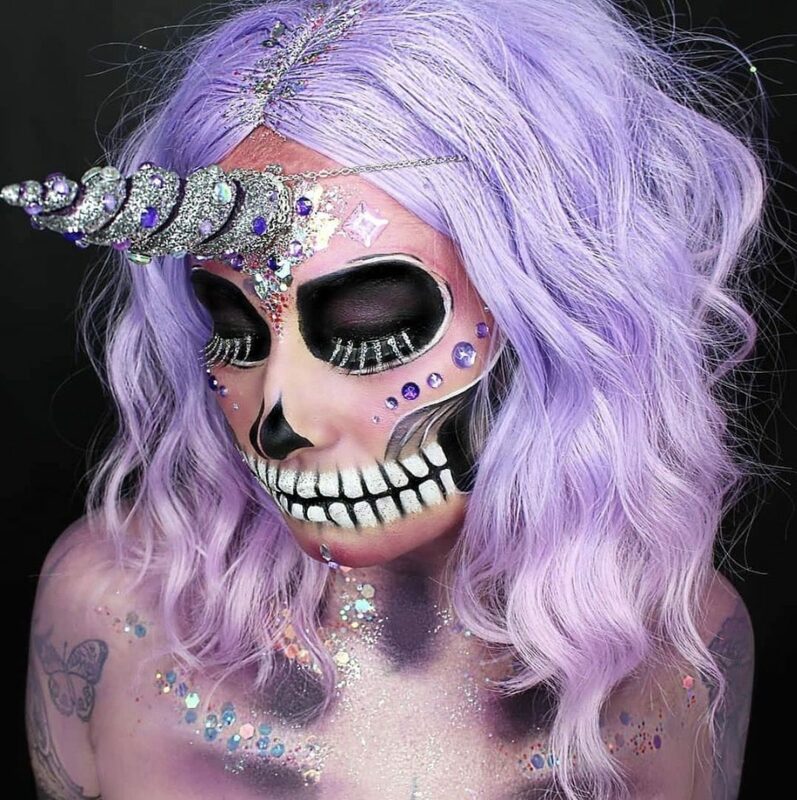 Amazon in particular has an amazing selection of everything that you could possibly need, including special effects makeup, colorful wigs, rhinestones, spooky contact lenses and much much more! As long as you remember to order everything about a week in advance, you should have everything that you need for the big day. What are you going to be for Halloween? Sound off in the comments.